Since the beginning of the written word, storytellers have shared myths about supernatural beings. So, I did tons and tons of research about vampires, superheroes, and other myths, since they all share common traits, and I wanted to tell a story based on what seemed logical. As a reader, I love magical realism. I want to believe. In order for me to believe, though, the story has to follow scientific laws. The idea of a person shifting into an animal form that’s ten times the size of its human form, or a person having the ability to fly without the required body mechanics, makes little sense to me. And in order for a body to function — corpse or not — it has to have a heart that pumps life-giving blood through its veins. But, I can’t discount that since biblical days, stories have amassed about sentient beings with superhuman strength. So… a new breed of character is born. 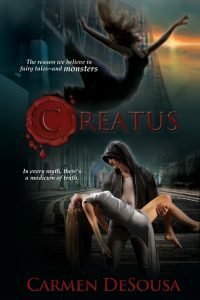 CREATUS, from the Latin word meaning "created" are the reason we believe in fairy tale — and monsters. Superheroes didn’t come about from being bitten by a vampire, a werewolf, or a spider. Instead, perhaps the same superior being who created us created them. Research. Tons and tons of research. Plus, I based my characters off what I like to read. Not too strong. Not too week. Believable. Relatable… My characters might be based on myths, but they still have to live in an all-too-human world, so therefore, I gave them human characteristics. Subscribers receive a free copy of my contemporary women's fiction / chick Lit novella "Unlucky In Love."